Boats will be at their busiest on weekends and holidays and during the Summer months, boats are also at their fullest at midday and late afternoon. If you want to travel with fewer people it's recommended to travel during the Winter months or, early morning and early evening. We are comparing Thames Hop-On Hop-Off River Cruise Prices from leading ticket suppliers and Try to find you Cheap tickets prices on the market. A great way to see London and move around the different parts of the city in the most scenic way possible! This cruise allows you to hop-on and hop-off as many times as you want at the 4 piers throughout the day so you can make your own sightseeing itinerary. Live commentary from a friendly local guide explains the history of the city and allows you to learn all about the sights and monuments that you're passing. The commentary is fun and informative - No facts and figures to make you fall asleep! The comfortable river boat has ample seating, toilet facilities as well as a bar and cafe so you'll be able to relax on the journey and enjoy some refreshments as the sights of London pass by the windows. Sit inside in the covered saloon with large windows offering panoramic views, or go up on the deck and feel the breeze blowing through your hair as you marvel at the city of London. A great way to see London's top attractions in the most scenic way possible. Great for travellers who want to learn about the city but don't want to be tied down with a tour group - This cruise allows you to make your own itinerary. Good for solo travellers whether old or young and families, including those traveling with young children. Your Experience With Thames Hop-On Hop-Off River Cruise? 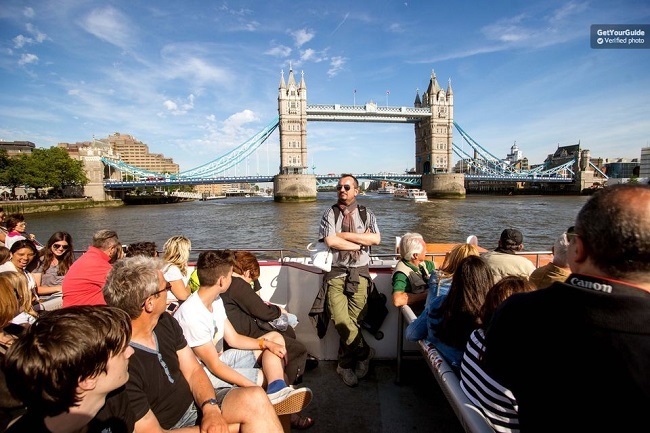 Enjoy unlimited travel during a 24 hour / 1 day period on the River Thames with the hop-on-hop-off sightseeing cruise that takes you to, and past, many of London's top riverside locations and monuments. You can join the boat at Westminster Pier, Waterloo/London Eye Pier, Tower Pier, or Greenwich Pier and, making your own itinerary, either hop-off at the next stop or stay onboard and listen to the commentary. A round-trip takes approximately 2.5 hours with the shortest 'hop' taking 20-30 minutes. Passing iconic sites including Big Ben, the Houses of Parliament, Westminster Bridge, The Shard, The Globe Theatre, Millennium Bridge, The London Eye, The Tower of London, Tower Bridge and so much more, you'll be able to learn the history of London and learn fun and interesting facts about all the sights that you pass from your friendly commentator and, of course, take a ton of photos! What Thames Hop-On Hop-Off River Cruise Includes? Be sure to take a ride down the River at Sunset for some stunning views! Travelers Reviews about Thames Hop-On Hop-Off River Cruise? Travellers talking about this Thames river cruise on Viator, Get Your Guide, and Trip Advisor give it very good ratings and very good comments, most people recommending this cruise to others and saying they would do it again in the future. People have said "We would never miss an opportunity to take the Thames River Cruise! It is relaxing, it's a chance to rest your legs after busy London walking excursions, and it's absolutely wonderful to see the buildings and architecture along the water" "Loved the commentary, found it humorous and anecdotal" and "We had a great time and would recommend it for others". Everyone agrees that the staff are helpful and friendly and that the crew members who commentate really make the cruise something special. Yes. Please advise staff when booking if you require wheelchair assistance. A paper voucher must be shown - E-vouchers are not accepted. Print your voucher - e-voucher's are not permitted. The hop on hop off sightseeing cruises depart from Westminster Pier, London Eye Pier, Tower Pier, or Greenwich Pier.